From about 1882 this shop and a workshop above were occupied by F.J. Hughes & Co. builders, house decorators and funeral undertakers. The business faltered and Joseph Francis Hughes, aged 47, was declared bankrupt in 1907, owing £239. The property was put up for sale or lease by the owner Mr John Cheshire, the jeweller from 3 Suffolk Road. The sale notice states that the premises were built for and had been in the occupation of the building and decorating trade for 60 years. The shop had a large plate glass window, a well lit workshop above (no longer evident, but still present in the photograph from 1948 below) and a basement to hold large stock. ​The building seems to have stood empty and was still unsold in April 1909, when White Bros grocers took it on as a temporary shop, following a fire in their premises on the corner of Suffolk Parade. When Mr Cheshire himself was declared bankrupt in 1914 the property was advertised again and once more in 1919. 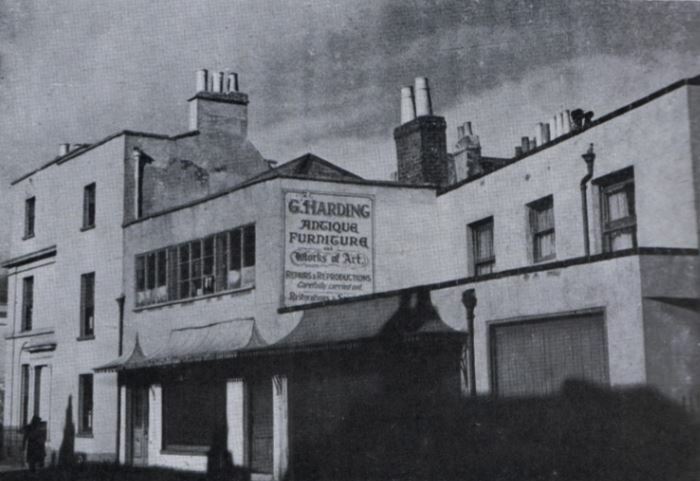 In about 1933 the shop was taken over by by Gilbert Harding, a Furniture Restorer, Art and Antique Dealer and then, in 1934, this this property changed from 8 to 5 Suffolk Road, when the whole street was renumbered. Mr Harding went on to occupy the adjacent shop also and was here until 1952. ​The trade directories are not very helpful in regard to any further business activities at this address until the early 1970s when the shop was home to Castle Antiques.